GENEVA, Jul 4 2018 - The international community has come a long way in combating racism, discrimination, xenophobia, extremism and religious intolerance, according to the Arab Group at the Human Rights Council. This came in a speech delivered today by Obaid Salem Saeed Al Za’abi, UAE Permanent Representative to the United Nations in Geneva, on behalf of the Arab Group before a general debate held as part of the 38th session of the Human Rights Council (HRC), affiliated with the UN. 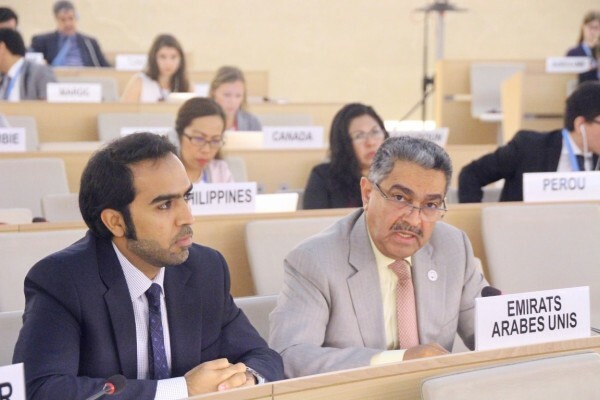 The UAE is currently the chair of the Council of Heads of Arab Permanent Missions to the United Nations in Geneva. The debate tackled racism, racial discrimination, xenophobia and related intolerance. The Arab Group noted that the international community had come a long way in combatting racism and expressed concern about emerging forms of racism and xenophobia, including acts that targeted migrants and refugees. The Group also indicated that some states were engaging in systematic acts of racism and discrimination against others, particularly against the Arabs, Muslims and people of African descent, adding that sometime, such acts take an institutional form. It regretted that such practices still persist in some states, despite the fact that the migrants have contributed positively to host countries. The Group stressed that all forms of racism must be criminalised, while all forms of exclusion must be rejected, while promoting the culture of tolerance and acceptance of others.